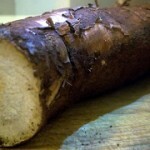 Currently viewing the tag: "mashed yuca"
Mashed yucaroot is a great side dish for any meal. Similar to mashed potatoes but a bit sweeter. Yuca is cheap, delicious, and easy to make for backpackers.